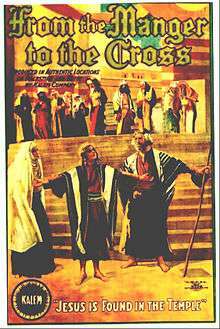 From the Manger to the Cross or Jesus of Nazareth is a 1912 American motion picture that was filmed on location in Palestine. It tells the story of Jesus' life. Directed by Sidney Olcott who also appeared in the film, actress and screenwriter Gene Gauntier wrote the script and portrayed the Virgin Mary. According to Turner Classic Movies, the film cost $35,000 to produce (roughly between $1,600,000 and $3,300,000 adjusted to 2007 dollars); another source says that Olcott spent $100,000 of his own money on the project. Although the film's profits eventually amounted to almost $1 million (roughly $46,000,000 to $95,000,000), the Kalem directors refused to increase Olcott's basic salary and he resigned. In later years, Louis B. Mayer, head of Metro-Goldwyn-Mayer, would say this was the premiere film for his movie theater in Haverhill, Massachusetts and a major boost for him in the movie business. However, most sources place the release date of this film as 1912, long after the opening of Mayer's theater. At around 5,000 feet it was one of the longer films to be released to date, although the Kinemacolor documentary With Our King and Queen Through India released in February 1912 ran to 16,000 feet; and another religious film The Miracle (the first full-colour feature film) - was released in the UK at 7,000 feet in December 1912. The five-reel film showed at the Queen's Hall, London, for eight months (a relatively lengthy run for the time). A statement by Israel Zangwill (founder of the Jewish Territorialist Organization) describing it as "An artistic triumph — the kinema put to its true end" appeared on advertising bills outside the Queen's Hall. From the Manger to the Cross gained considerable publicity from an outcry in the Daily Mail: "Is nothing sacred to the film maker?" it demanded, and waxed indignant about the profits for its American film producers. Although the clergy were invited to see it and found little to be affronted by, the controversy resulted in the voluntary creation of the British Board of Film Censors which began operating on 1 January 1913. The film disappeared from cinema screens for a number of years until the Rev. Brian Hession, vicar of Holy Trinity Church in Walton, Aylesbury, Buckinghamshire, went on a quest to the US to find a copy of the film for re-issue in Britain. Although initially disappointed, he eventually discovered a set of negatives after searching in the vaults and cellars of old film concerns. Hession added a musical sound track and spoken commentary, and From the Manger to the Cross was re-released in 1938. TCM host Robert Osborne and the National Film Preservation Foundation consider this film to be the most important silent film to deal with the life of Christ. In 1998, the United States Library of Congress deemed the film "culturally, historically, or aesthetically significant" and selected it for preservation in the National Film Registry. A history of cinemas and film-making published in 1947 had this to say: "To-day it appears to be somewhat overacted, and the camera work is stilted, the camera being merely a recording instrument and not part of the pattern of the exposition of the story itself. Its pace is slow by modern standards, doubtless an attempt to obtain dignity, and Bland's performance is so sedately remote as to be not so much an acting performance at all but a series of dignified poses." ↑ Wood 1947, pp. 163-6. 1 2 3 4 5 Wood 1947, p. 167. ↑ Kevin Brownlow, 'Silent Films: What Was the Right Speed?' Sight and Sound, Summer 1980, pp. 164-167. ↑ James Card, 'Silent Film Speed' Image, October 1955, pp. 55-56. ↑ McKernan, Luke (2009). 'The modern Elixir of Life: Kinemacolor, royalty and the Delhi Durbar', in Film History, Vol. 21, pp. 122–136, 2009. ↑ Wood 1947, pp. 167-8. ↑ Wood 1947, pp. 166-7. ↑ From the Manger to the Cross (1912). BFI. Retrieved 11 February 2016. Wikimedia Commons has media related to From the Manger to the Cross.